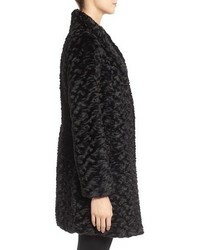 For a cool-meets-chic look, wear an Eliza J faux persian lamb fur a line coat and black leather skinny pants — these pieces fit perfectly well together. When it comes to shoes, this look is finished off nicely with black suede pumps. If you're in search of a casual yet absolutely chic getup, pair an Eliza J faux persian lamb fur a line coat from Nordstrom with burgundy leggings. Both pieces are totally comfy and will look fabulous paired together. Kick up the cool of your getup by complementing it with dark brown leather loafers. 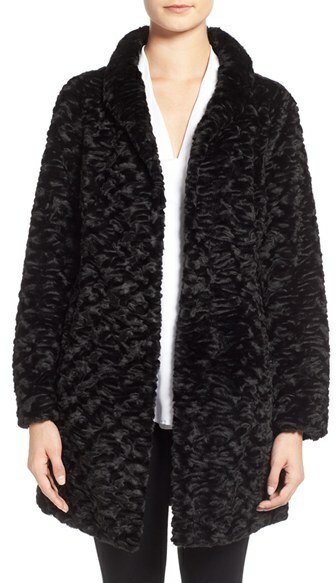 For a knockout-meets-stylish outfit, make an Eliza J faux persian lamb fur a line coat and black leather skinny pants your outfit choice — these items go really well together. 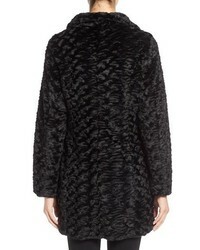 Reach for an Eliza J faux persian lamb fur a line coat and a hot pink mini skirt and you'll look like a total babe. Finish off your outfit with black leather heeled sandals. For a casual totally stylish look, dress in a black fur coat and black leather skinny pants — these two items go really well together. When it comes to footwear, this outfit is finished off nicely with black leather ankle boots. Consider pairing a black fur coat with black dress pants for a ridiculously gorgeous look. When it comes to footwear, this ensemble is finished off really well with black leather heeled sandals. If you're scouting for a casual yet totally chic look, try teaming a black fur coat with light blue ripped boyfriend jeans. Both items are totally comfy and will look fabulous paired together. Sporting a pair of white and black cutout suede ankle boots is an easy way to add extra flair to your ensemble. 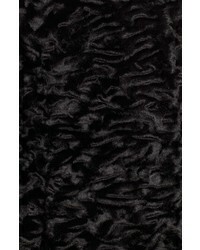 For a nothing less than drool-worthy getup, rock a black fur coat. A pair of black leather knee high boots brings the dressed-down touch to the outfit. For a casual chic outfit, go for an Eliza J faux persian lamb fur a line coat from Nordstrom and a navy embroidered midi dress — these two items fit pretty good together. To bring out a sassier side of you, round off your outfit with black suede knee high boots.